Normangate Field, next to Castor, contains the biggest Roman industrial estate that has been found in Britain. 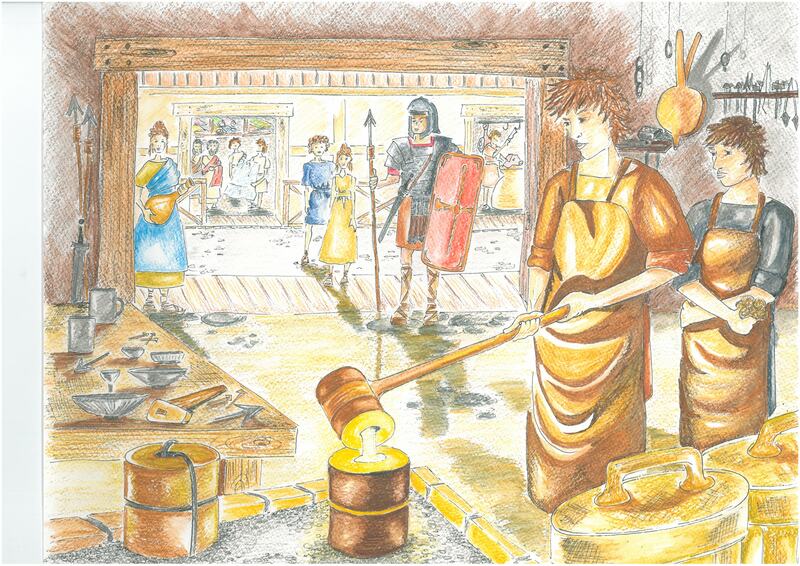 The main money- making industries for Durobrivae were pottery making and metalworking although lots of other things must have been made there as well. The Romans needed pots to store food and water, to prepare and cook food as well as for tableware. So many thousands of pots must have been made in the area, both to be used in the local town but also to be sold and taken to other markets a long way away. The blacksmiths used to make their iron tools for all the different trades as well as the nails and fittings needed for buildings and the implements needed for farming. 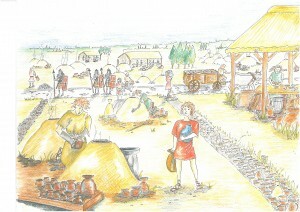 The main pottery site in Castor was Normangate Field. The reason it was not within Durobrivae town itself was because the pottery kilns and furnaces were smelly and smoky, so the town council might have passed a law ordering those industries to be outside the town. Each potter or blacksmith might live where they worked or in the town. Castor had its own type of pottery, we now call it Castor Ware or Nene Valley ware. It was a colour-coated unique to Castor and has been found all over the province of Britain. Hundreds of pieces of Castor ware have been found under Normangate field but there were other kinds of pottery as well- greyware for cheaper pots, shelly ware and the more expensive Samian ware that came from Gaul or Italy. Pottery kilns covered Normangate field alongside ironworks, blacksmith’s forges and workshops for all sorts of other industries such as brick and tile-making, weaving carpentry and woodworking milling, brewing baking and lots of other things! It must have been a very noisy and busy place! Hello I am a famous potter I make the best pots in town and I’m wealthy and popular with the people. I work in Normangate Field, but I live in the town of Durobrivae with my friends. It is easy to get to work every day, I just walk over the River Nene across the bridge. I like making pots on my potter’s wheel which I spin with my foot. Sometimes I put my name on them! I get my money from making colour-coated pots and sell them to the merchant who then sells them to the people in the town or the big villas. It’s called ‘colour-coated’ ware because I dip the pots in a coloured dip before I fire them in the kiln. People pay good money for colour-coated ware and shelly ware as well because it is really beautiful and popular which earns me money for good food and a healthy life. This is why being a potter is a good job to have for everyday life, although my back aches a lot after along day bending over my wheel! Hello my name is Titus and I am a fabulous potter, by far the best potter in Durobrivae! I have few friends and I don’t know why not – for I am wealthy, a great potter, what more do you want in a friend? I don’t make the pots myself now –I employ a whole team of potters like Katya who make the pots for me. I buy the pots from them and then sell them at a profit. I also pay for people to take them by wagon to other towns or even by boat along the river and then up the coast to Eboracum or beyond. What we call Colour-coated Ware is a big a part of the money I make for it is special to our area so you know where it’s from. The decorated beakers and bowls we make are very popular, especially the ‘hunt cups’ that are decorated with hunting scenes. After a busy day buying and selling I like to visit the public baths in the town. I am a regular bather in the caldarium, the hottest room of all – it burns your skin and then I jump in the cold frigidarium! Then a slave scrapes my skin with a strigil to get off all the grime. Lovely! A hobby of mine is giving dinner parties: I get my cook to use herbs and spices to flavour the dishes and follow them up with fruit and oysters. We also drink the best wines I can get –mixed with water of course!